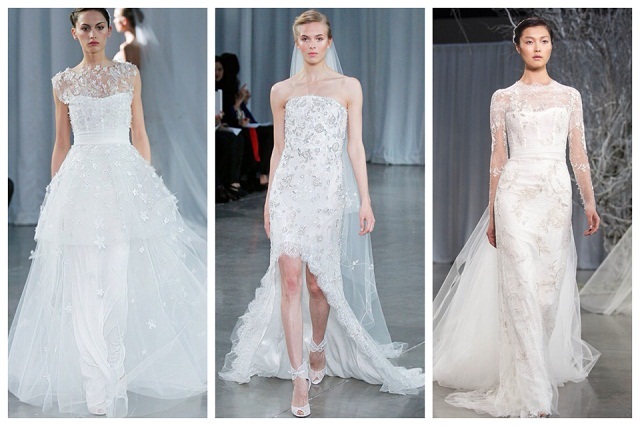 As usual, Monique Lhuillier has designed a collection of wedding gowns that rocks our world. 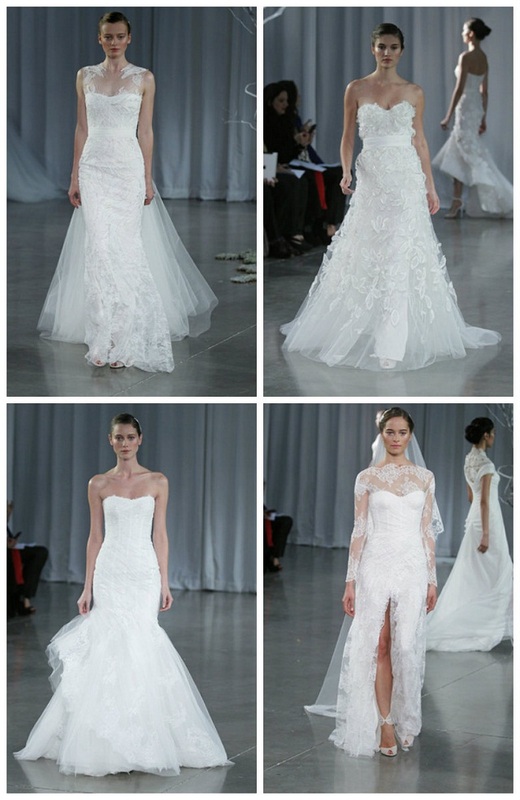 Her Fall 2013 collection is all about a modern, fairy tale of romance with light tulle overlays, lacy illusion necklines, long sleeve columns, and wispy feminine florals. There’s even plenty of shimmer and sparkle on many of the silhouettes, just enough to satisfy every bride’s dream bridal style! 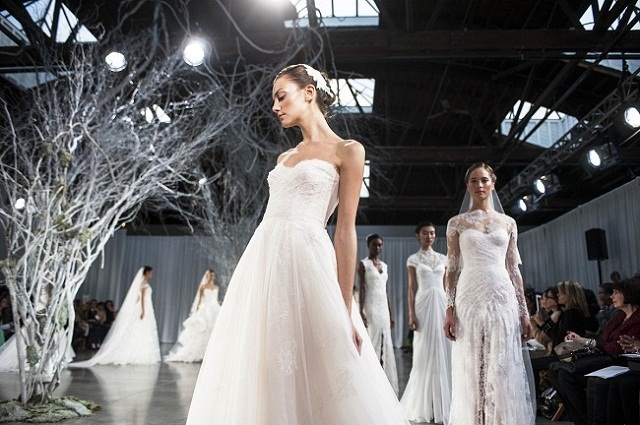 And, there’s a hemline and neckline for everyone as the collection includes contemporary high-low gowns, Hollywood-inspired A-line gowns with cap sleeves, one-shoulder tulle necklines, shirred and draped form fitters, corseted mermaids, as well as the traditional strapless ballgown. What is simply ingenious about the collection is that all gowns designed with an overlay can transform into a different look simply by removing it! For that after-party, rather than purchasing another gown entirely, you just need to remove the overlay, change your hair and jewelry and VOILA! You’ve got a whole new look to work. 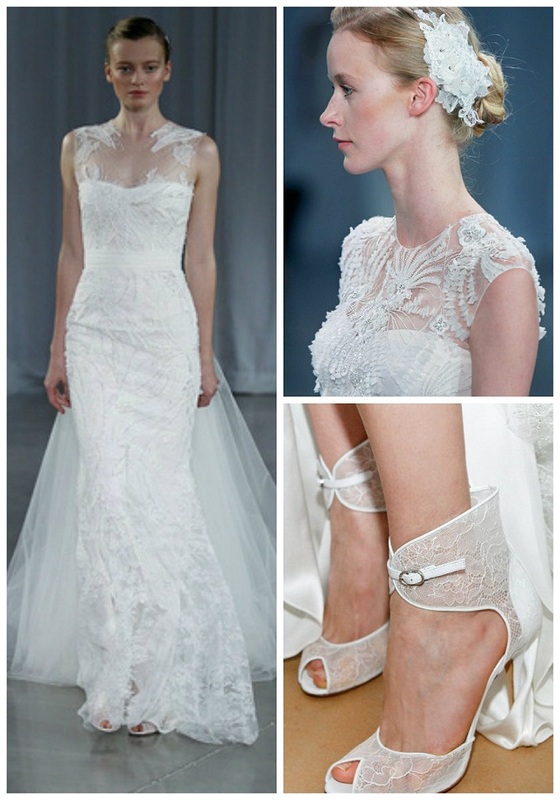 The Monique Bride loves to feel red carpet ready, blending romance with sensuality right down to her toes! Monique’s new line of bridal shoes not only completes the look as she intended, but also makes a dramatic fashion statement. Other than seeing these beautiful gowns float past us down the aisle or dance around us on the dance floor, we find event design inspiration in the look and feel they convey overall. We’re already envisioning wedding design concepts with whimsical, dreamlike gardens. If you haven’t seen the collection yourself, take a little look at some of our favorites here… or hop up to Manhattan as Monique Lhuillier’s new boutique opened this month.